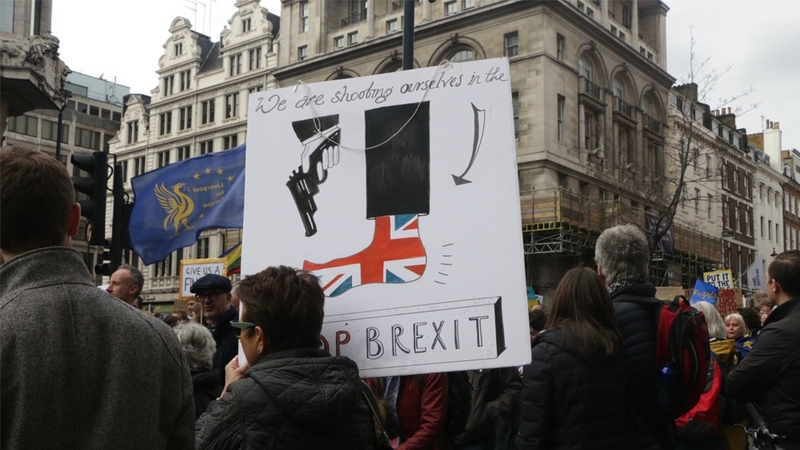 London, United Kingdom – Hundreds of thousands of people have poured onto the streets of central London asking to have a final say on Britain’s departure from the European Union. People of all ages from across the political spectrum joined campaigners on Saturday for a “people’s vote” to protest against the government’s handling of Brexit – many of them hoping for a chance to reverse the result of a 2016 referendum, which saw 52 percent of voters opting to leave the bloc. “I’m sorry, could you repeat the question?” read one placard. 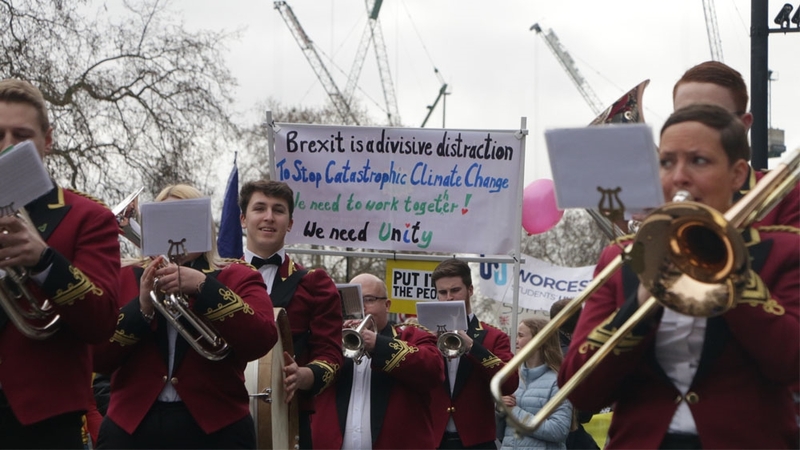 Dubbed “Put It To The People”, the march is organised by the People’s Vote campaign, which includes more than 100 grassroots groups advocating for a public vote on the Brexit deal with the EU, and is supported by a number of pro-European organisations. In a televised speech on Wednesday, Prime Minister Theresa May told the British public: “I am on your side.” She reiterated her determination to deliver Brexit and blamed parliament for the deadlock. “Mrs May has insulted our democracy by insulting our MPs,” said protester Penelope McEwan, a 53-year-old teacher and environmental activist married to a EU citizen. Once the UK is out, she is worried out about what environmental policies the UK will adopt. “There is a lot of uncertainty about our future,” the 44-year-old told Al Jazeera. “There is a possibility that we will have to leave this country, but we don’t want to. This is our home,” she added. The last People’s Vote march in October was one of the largest in decades, attracting an estimated 700,000 people. With only days to go before the UK’s scheduled departure date of March 29, EU leaders agreed this week on a dual-deadline mechanism to grant the UK some extra time. The UK will leave on May 22 if the British parliament passes the deal. If it doesn’t, it will have until April 12 to indicate a way forward, which could include asking for a longer extension and agreeing to hold European Parliament elections. While the Labour leader Jeremy Corbyn did not take part in the march, the party officially supports a second referendum. It is also mulling over endorsing a plan by two of its backbenchers that would see MPs vote for May’s deal on the condition it is then put to a public vote. A snap poll this week found nearly two-thirds of respondents would prefer remaining in the EU over leaving with May’s deal. Meanwhile, a “March to Leave” walk organised by former UK Independence Party (UKIP) leader Nigel Farage, considered one of the architects of Brexit, took off from Sunderland last weekend. 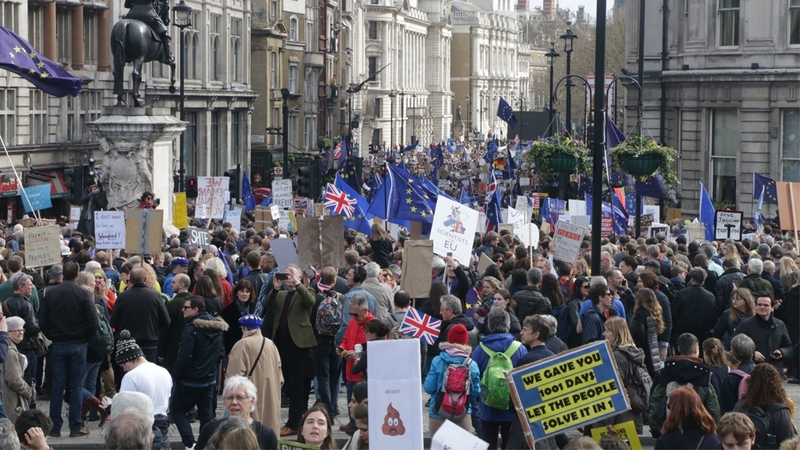 A few hundred people began the first leg of a two-week protest due to end in Parliament square on March 29, accusing politicians of “betraying the will of the people” over Brexit. While Labour supports a “softer Brexit”, including closer economic integration with the EU, the hard Brexit wing in May’s own Conservative Party has been voting down the deal over the so-called backstop – a protocol of the withdrawal agreement to avoid a hard border in the island of Ireland, which they believe would tie the UK to the EU’s trade rules indefinitely. “In 2016, Northern Ireland wasn’t mentioned and it’s now become what the government calls a major stumbling block,” Doire Finn, the 24-year-old Northern Ireland coordinator of Our Future Our Choice, a youth campaign group supporting the People’s Vote campaign, told Al Jazeera. “Because I live so close to the border, I don’t like my life or the people who have built lives on a border that is completely frictionless, to be called a stumbling block,” Finn added.